SS4373 8588. In the limestone cliffs high above the rocky shoreline at the south-western side of the Gower Peninsula 1 mile south-east of Middleton is the now largerly inaccessible Paviland Cave or ‘Goat’s Hole’ which has been eroded away by the power of the sea over many, many thousands of years. The cave is some 1o metres deep and 7 metres wide. In 1823 archaeological excavations were carried out here by Revd William Buckland of Oxford University and, more recently in 1912, by L.W.Dillwyn and a Miss Talbot of Penrice castle, Gower. Bones of ‘The Red Lady Of Paviland’. In the 1823 excavations a headless skeleton (thought to be from the Roman period) of a female was discovered which was covered in red ochre – thus we got the name ‘the red lady of Paviland’. With the skeleton various grave goods and decorative items were found including a mamouth’s skull, sea-shell necklaces, ivory, antler and bones. After laboratory investigations the female skeleton was, in fact, found to be that of a well-built male aged about 25 of the Cro-Magnon race of the Palaeolithic people of France; the radio carbon dating gave a time period of 24,000 years BC. In the more recent excavations some 4,000 flints, animal teeth, necklaces, stone needles and ivory bracelets were discovered. 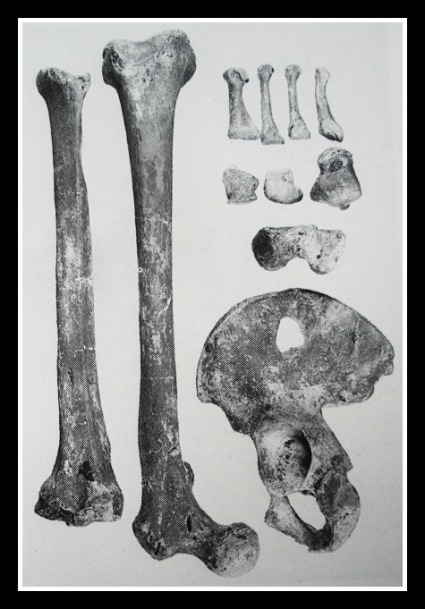 These artefacts were deposited in Swansea museum and The National Museum of Cardiff, while the red lady skeleton was given to the University Museum of Oxford. They were also signs that Paviland cave was inhabited in the Mesolithic and Neolithic periods and, perhaps in more recent times by the Romans? Categories: Caves & Rock Shelters, Paviland Cave, Red Lady Of Paviland | Tags: Paviland Cave on Gower Peninsula in West Glamorgan | Permalink.